Do You Have the Updated Cycle Trader App? If you haven’t downloaded the Cycle Trader app, what are you waiting for? Our app gives you the power to access our content wherever you go - and the best part? It’s even better than before. The newly updated Cycle Trader app features a brand new look. The modern design is faster and the updated user interface elevates your experience, allowing you to navigate through hundreds of thousands of listings with precision and ease. We have also added recommendations on the home screen that are based on your previous search, just another way our new app was designed with you in mind. In the app, you have the option to filter your listing search by type, location, year, make, price, mileage, and so much more - taking the hassle out of finding your new ride. You can also search for the nearest dealer and their current inventory so you can take that all important test drive. Once you create and login to your My Trader account, saving a listing you like or might be interested just takes a click. The app saves your searches and syncs them with your desktop account, so you can easily access your prefered listings on any device. You also have the option of setting up price drop alerts on the app that will notify you via push notifications and email when a unit’s price has dropped, helping to make sure you get the best deal on your new bike. In the coming months, we’ll give you the opportunity to easily sell your bike through our mobile app without having to access our website. You’ll be able to take photos through the app, post, and sell your unit fast. We'll also be looking to add functionality around buying bikes directly through our app with Apple Pay and Google Pay - so stay tuned. To download the updated Cycle Trader app, visit the iTunes App Store today. 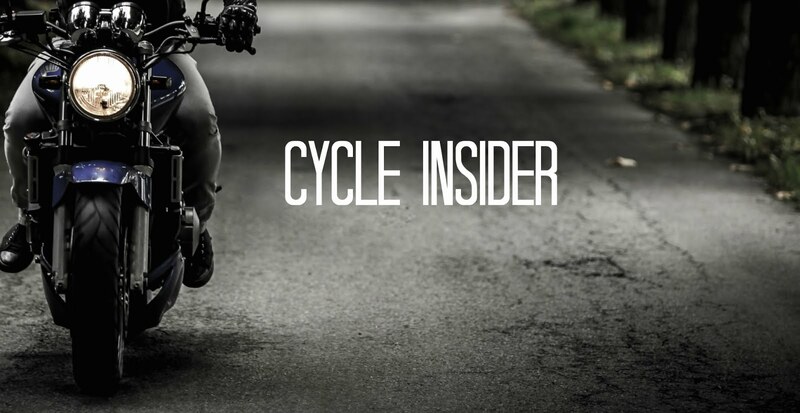 Need the latest motorcycle industry news and updates? Don’t worry - we’ve got you covered. Check out the latest headlines that piqued our interest this month. Honda Announces American Debut of Monkey and Super Cub Motorcycles - Honda recently announced that their line of retro-style motorcycles will debut in the U.S. later this year. The new line was first unveiled at the Tokyo Motor Show in 2017 and could be available as early as October of this year. The Monkey is a 125cc- powered retro-style bike with smaller dimensions, making it easier to ride. It comes in two colors, banana yellow and pearl nebula red. 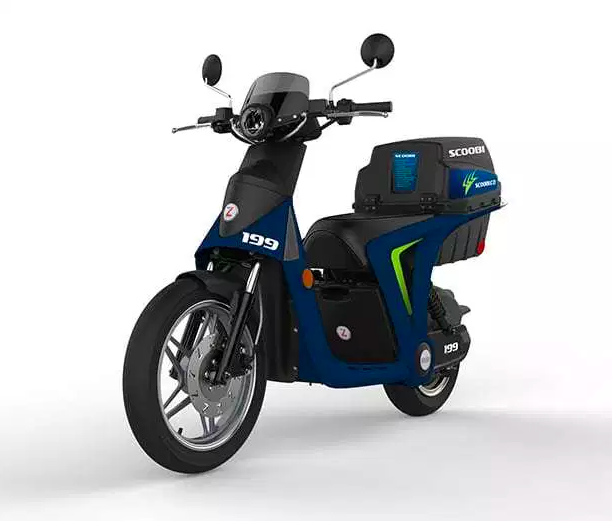 The Super Cub will be offered in just one color, pearl niltava blue, and aims to be a utilitarian motorcycle that riders can enjoy in a variety of settings. We love seeing retro-styled bikes come back with updated features, so we are pumped to see these two models released and out on the road. Read More. Yamaha Releases All-New Adventure Pro GPS - The Yamaha Adventure Pro powered by Magellan, is their recently released advanced off-road and mobile GPS tablet device for all of you powersports folks out there. The device is aimed to give more confidence to off-roaders and includes thousands of OHV routes from forest to public lands. You can access a community trail database and even share your trips on social media through the device. The GPS also has the ability to provide the diagnostics of your vehicle to make sure it’s in top condition for your next off-road experience. This thing does it all. Read More. 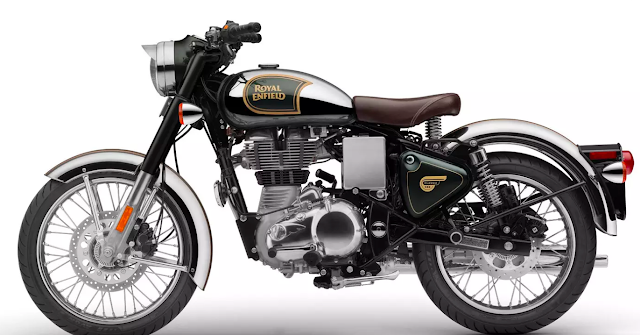 The 2018 Royal Enfield Classic 500 Offers Riders New Updates - Royal Enfield has announced new updates to their best-selling Classic 500 model. The 2018 Classic 500 comes with new color schemes, along with mechanical upgrades including anti-lock brakes, rear disc brakes, and a passenger pillion. The company is aiming to keep their models competitive within the motorcycle industry and we think updating an already best-selling model is a smart move on their part. Read More. Dockless Electric Scooters Launched for Pittsburgh Commuters - Pittsburgh is offering its residents a new way to get around the city. Scoobi, an on-demand mobility service, has introduced Pittsburgh’s first dockless electric scooter fleet, which includes around 100 scooters. So how does it work? Riders can find these scooters using Scoobi’s app, which shows available scooters throughout the city, and holds the selected vehicle for 10 minutes. 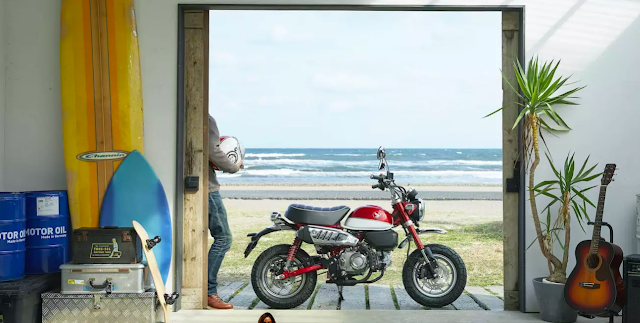 The app also shows the battery life for each scooter, enables the vehicle to start, plus provides access to two different-sized helmets upon unlocking the scooter’s trunk. We’re excited to see how the city of Pittsburgh uses these scooters and whether or not the idea will expand to other cities. Read More. Harley-Davidson Partners With Men’s Grooming Brand American Crew - Harley has announced a partnership with American Crew, a men’s grooming brand, to craft unique experiences and events for consumers all over the world. Their new campaign, Style for the Road, will feature these ads (as seen below) in salons and barber shops around the world. The two brands will come together in several social media activations and public relations initiatives over the course of the partnership, including Harley-Davidson’s 115th Anniversary celebration this August. We have to admit, when we first read this headline, we scratched our heads. But we’re definitely interested to see more of this partnership once the campaign launches in July. Read More. 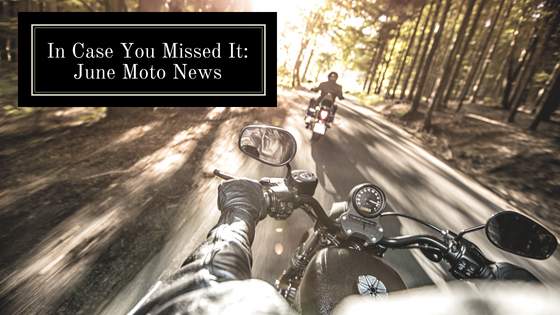 There you have it - the latest June moto news. Comment below with your opinions and thoughts on these headlines. Women, motorcycles, and camping - what more could you ask for? 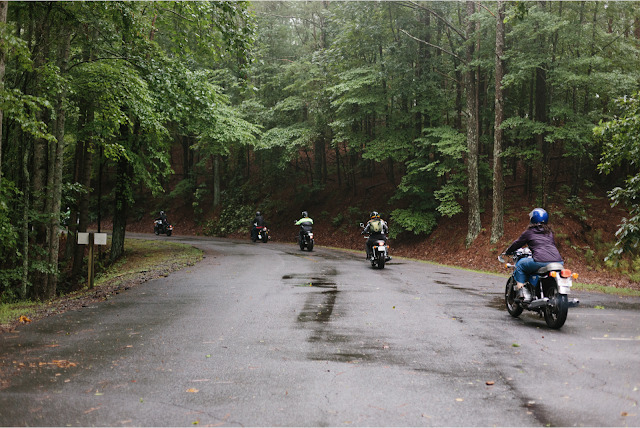 Over the past five years, all-female motorcycle rallies have grown in popularity and in number. These events provide a community for women to come together to share their love of two-wheeled riding, camping, and a good time with fellow moto babes. For the media socialites, the events also provide unique insta moments for everyone’s liking. In 2015, East Coasters Jamie Sheard, Abby Whisenant, and Kari King set out for the California desert to camp with a thousand girls from all over the world at Babes Ride Out. 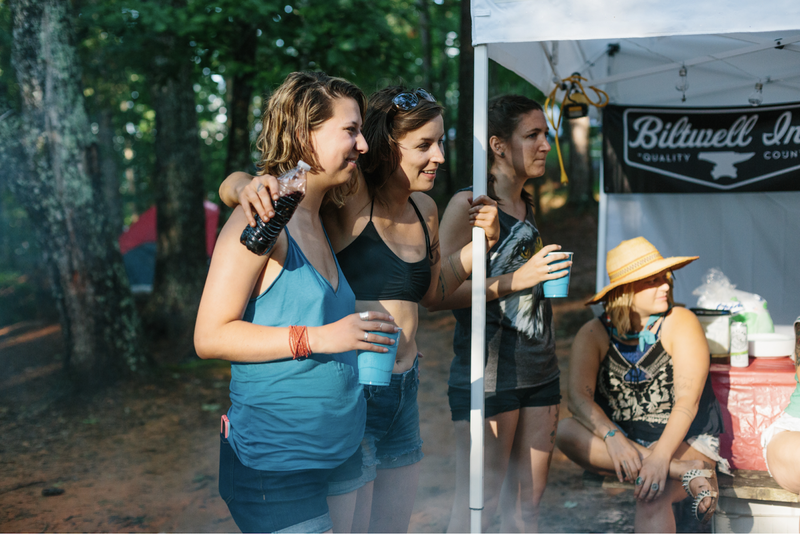 The desert experience left a lasting impression on Jamie, Abby, and Kari, and it wasn’t long before they started planning their own East Coast event: “We talked about how it would be awesome to do something similar, on a more intimate scale, in the Southeast,” said Sheard. Between Jamie, Abby, and Kari, they knew members of the Lady Fingers (Atlanta, Georgia), the Litas (Richmond, Virginia and Charlotte, North Carolina), the Hellcats (Nashville, Tennessee), and the Vagabroads (Chattanooga, Tennessee). 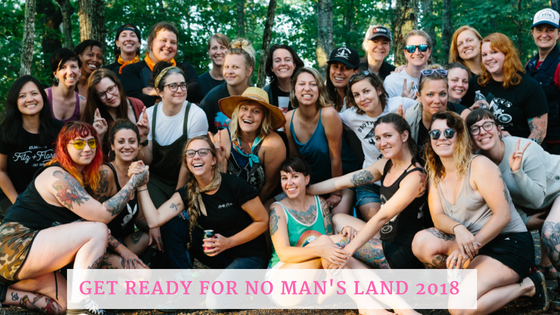 In June of 2016, after loads of planning and discussions over beverages, 50 babes from these clubs converged on a campground in the Smoky Mountains of North Carolina… and just like that, No Man’s Land was born. What sets No Man’s Land apart from other moto camping rallies? For one, it’s its migrating location: “The idea to move it around evolved as we were working through the plans for the 2016 event. It occurred to us that some groups would have to travel farther than others every year if we kept it in the same spot,” remarked Sheard. Not only does moving the location around amongst the clubs’ home states allow participants to see different parts of the Southeast, it also spreads out the responsibility of planning and organizing the event to the host club. The other thing that sets No Man’s Land apart from other rallies is the intimacy. Over the course of of 3 days and 2 nights, can you really get to know hundreds of people? Perhaps, if you’re the Flash. Based on my ordinary non-superhero experience, spending a long weekend with 50 ladies was refreshingly personal. We cruised on winding roads, we swapped stories, we laughed, we swam, and some of us sang. The intimate setting is why I keep coming back. On this third year, my club (the Litas of Richmond, Virginia) is hosting. As we finalize ride routes and checklists, we look forward to catching up with our moto sisters and showing them a turn or two on the Blue Ridge Parkway. Let’s hope the bugs are kept at bay. No Man’s Land runs from June 22-24. For more information click here.